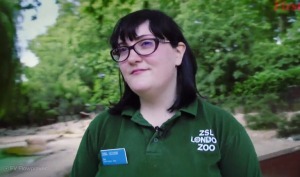 I am a senior keeper at ZSL London Zoo, and I mainly work with penguins and macaws. My role includes providing a high standard of care for the animals, preparing food for and feeding the animals, cleaning out enclosures, keeping healthcare records, training animals and providing enrichment for them. About eight years ago, while studying for a BTEC National Diploma in animal care as a mature student at Capel Manor College, I also began volunteering in the Reptile House at ZSL London Zoo. I tried to work as hard as possible and show passion, enthusiasm and commitment to my work. This paid off , as I was eventually offered a seasonal position as a zookeeper for five months. After this, my contract was extended and then a year later I became a trainee keeper on the herpetology (amphibians and reptile) section. The rest is history! The animals! They’re all incredibly interesting and diverse. I’ve worked with lots of different species over the years, and there is always so much to learn about each and every animal. I find it fascinating. I love working with penguins, in particular, because they are very charismatic and each of the 73 penguins I work with has their own distinct personality. You have to work outside in all weathers, so sometimes it can be challenging working outside in very hot weather or when it’s snowing. Also, being a zookeeper can be physically demanding, as we often have to lift and carry around heavy objects when we’re cleaning or redesigning enclosures. We need good arm strength for all the cleaning and scrubbing that the job entails, but it does mean that eventually, the more we do these things, the stronger we become. You need to care passionately about animals, as well as have excellent observation skills, so that you can notice any changes to the animals physically or behaviourally. Excellent communication skills are also needed, because as a zookeeper there is lots of visitor interaction. You will need to answer any questions visitors might have about the animals. IT skills are also desirable, as we often use computer programs to record animal information, such as their weight, their enclosure, their diet, health information, their relationships with other animals in that same group, or any offspring they may have. We can then share this information with other zoos. What does an RSPB Mull Officer do? What does an Aquatic Vet do? What does a Senior Physiologist do? What does a Clinical Nurse do? What is it like to be a Koala Keeper? What does a Senior Midwife do? What does a Zoologist do?